MOST of us are planting the seed of worry in our mind as we go through the path of life. As we face the breaking of a new dawn, we always have that fear or worry of what will the day bring. It is therefore very important to know the true meaning of worry so that we can minimize or lessen its power to dominate us and therefore be worry free. The word \'worry\' is derived from an old Anglo-Saxon word meaning to strangle or choke. Worry is like someone is placing his fingers around your throat and press with full strength, cutting off your vital supply of air. It blocks off your own flow of power. Worry frustrates your best functioning. 1. Fill your mind with the fear-eliminating words of the Bible. There is an enormous power in the words of the Scriptures. The Bible says, 'If ye abide in me, and my words abide in you, ye shall ask what ye will, and it shall be done unto you (John 15:7). Repeat the passage many times during the day, conceiving of it as dropping your conscious into your unconscious by a process of spiritual osmosis. Visualize your unconscious as grasping it and fully absorbing it into your personality. 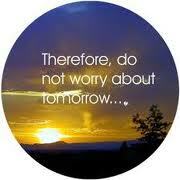 If you truly absorb this and live by them, you will definitely gain control over worry. 2. Trust God and live a day at a time To pass through the path of life with flying colors one must have a strong faith in the Lord, no matter how small it might be, even it be as small as a mustard seed. 5. Decide to stop worrying. Indeed, life is what we make it. If you want your day to be sunny, full of hopes, and worry free, it can be. If you want your day to be gloomy and full of fears, it can also be. The choice is yours. Each one of us has the options to make our day great or another rotten existence in this side of the earth. Stop worrying now and start living your life to the fullest.